STORM LAKE, Iowa (CNS) — Darwin Josue Mejia Montoya could have been shot during protests in Nicaragua last year. He also could still be languishing in a detention center in Arizona, after escaping the violence. But Montoya credits prayers — particularly to Mary — for enabling him to be one of the few individuals granted asylum in the United States from the Central American country. 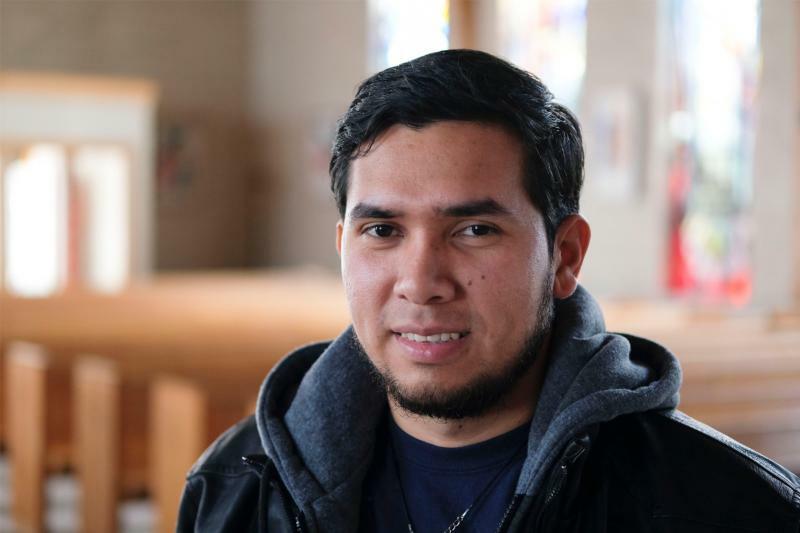 Speaking through interpreter Araceli Reyes, assistant for Hispanic ministry at St. Mary Parish in Storm Lake, Montoya recalled his calmness while waiting to hear if he would be granted asylum. The youngest of six children, Montoya grew up in Boaco, Nicaragua. His parish is Parroquia de Santiago Apostol (Parish of St. James the Apostle) — where he received the sacraments of baptism, Communion and confirmation. One of the priests who served at Santiago was Father Sergio Antonio Alvarez Aleman, with whom “Darwin is a good friend,” explained Father Tim Friedrichsen, pastor of St. Mary in Storm Lake and Sacred Heart in Early. Montoya would join Father Friedrichsen and Father Sergio on some of their day trips three years ago. Following his high school graduation, Montoya studied computer engineering and got a job at a diocesan Catholic school. “During this time, I did a lot of service work,” he said. “I joined the Association of the Miraculous Medal and we evangelized in the rural areas.” He ultimately became president of the group and learned more about the struggles people were experiencing. He started working for a cellular company, which encouraged employees to peacefully protest the recent taxation and social security policies of President Daniel Ortega. The violence escalated and about 40 people were killed, he added, noting that he was threatened by paramilitary personnel, who held a gun to his head and promised they would kill him at the peaceful demonstration. “I imagine I was targeted because I was wearing the work badge of the company. We would travel to our accounts, not even protesting, and saw armed police,” Montoya continued. By this time, Montoya estimated more than 1,000 juveniles were missing. Montoya had considered a move to Costa Rica but realized life would not be better in that Central American nation. “A friend of mine had a brother in the U.S. who could help us gain entry,” he said, adding that it never crossed his mind to enter the country illegally. Montoya shared his plans with Father Friedrichsen, who advised him not to come because the trip was long and too dangerous. But Montoya made the journey to Mexico anyway with the clothes on his back, a small bag of items and a Miraculous Medal around his neck. He and a friend arrived in Nogales, Mexico, at a port of entry, and asked for asylum. They ended up in a detention center in Eloy, Arizona, about 100 miles from the border. Father Friedrichsen wrote letters and worked with lawyers to facilitate Montoya’s case while the young man went through several lawyers during his stay at the detention center and prayed the rosary every day. He had numerous meetings and court dates that resulted in no decision or postponement. On the Jan. 22 court date, he had spent six months and five days in detention. “I have to believe that Vice President Michael Pence’s condemnation of the Ortega government’s violence against the people who were exercising their freedom of speech, as well as violence against their freedom of religion, was very helpful in Darwin’s case,” Father Friedrichsen speculated. With tears in his eyes, the priest said he was happy his friend was safe. He also said he was glad Montoya didn’t follow his advice and stay in Nicaragua. “This ordeal has weighed heavily on my heart and mind, as do the ordeals of so many who will not be as fortunate as Darwin has been,” Father Friedrichsen said. Montoya now calls Storm Lake home and is beginning the process of getting a Social Security number, a job and taking English classes.